To give a better idea who I’m battling the elements with, I’m writing up brief profiles of my closest friends in the Peace Corps. I have a strong feeling that these friends will be so for many years to come. I may not see them much after my return, but much like soldiers in war, there will be no others who can truly relate to life in Peace Corps Thailand. 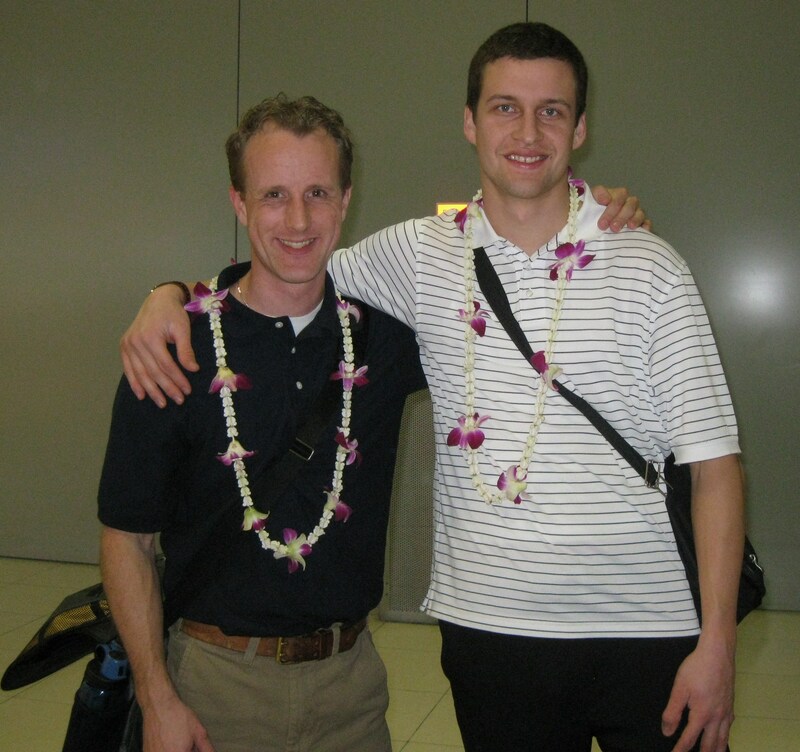 Mark was my first Peace Corps friend, so it only makes sense I write about him first. Mark and I met on the plane from Minneapolis to Philadelphia. We introduced ourselves after the plane landed, but had actually spotted each other in Minneapolis. Mark was ahead of me in the security line. I was pretty sure he was a volunteer with his slip-on loafers and his family watching him go through the metal detector. Moments after landing in Bangkok in January. If I ever feel homesick, I only need to talk to Mark as we rarely talk about anything but Minnesota. I’ve never had much interest in the Minnesota Gophers football team, but after listening to Mark talk of the new Big Ten divisions, I’m interested. Mark, in a rare serious moment, during training. We also trade tales of Minnesota sports history and the good ol’ days when Bobby Jackson and Sam Jacobson ruled Williams Arena, or when the Vikings managed to go 15-1 before choking in the NFC Championship game. Football is one of my least favorite sports, but Mark gets me interested. It’s not really about the football though, it’s about Minnesota. Our weekly conversations usually start with some outrageous request Mark has received from his office. Then I tell a story to empathize and we both laugh at the crazy situations we’ve put ourselves into. I started learning about different cultures in the Peace Corps before I even set foot on foreign soil. Talking with other volunteers from around the country, I’ve a great feel for the differences in American culture. I say the word “Leiniekugel” and volunteers think I’m talking about an old Swedish canoe fashioned from elk bone. I hear different accents and then am told I have an accent. This is when I say, “Yeah, but it’s not as strong as Mark’s.” I know Mark has a strong Minnesota accent because I hear it every time I talk with him and I’m not supposed to. It’s supposed to blend with mine. Mark lives in Phatthalung, the farthest province away from mine. He’s in southern Thailand, near the ocean. We’re both hoping I can make it to his site sometime before early 2013. Until then we’ll have to settle for phone calls and e-mails. Mark, as Abe Lincoln, during the Fourth of July parade. Mark’s father is a park ranger at a Minnesota State Park, so much of our conversations talk of which state park we’d like to be at that week. Wouldn’t you love to be hiking through Banning right now? Or how about walking along the shore at Gooseberry on a chilly, quiet Tuesday afternoon? In a sense, when I talk with Mark, I am home. 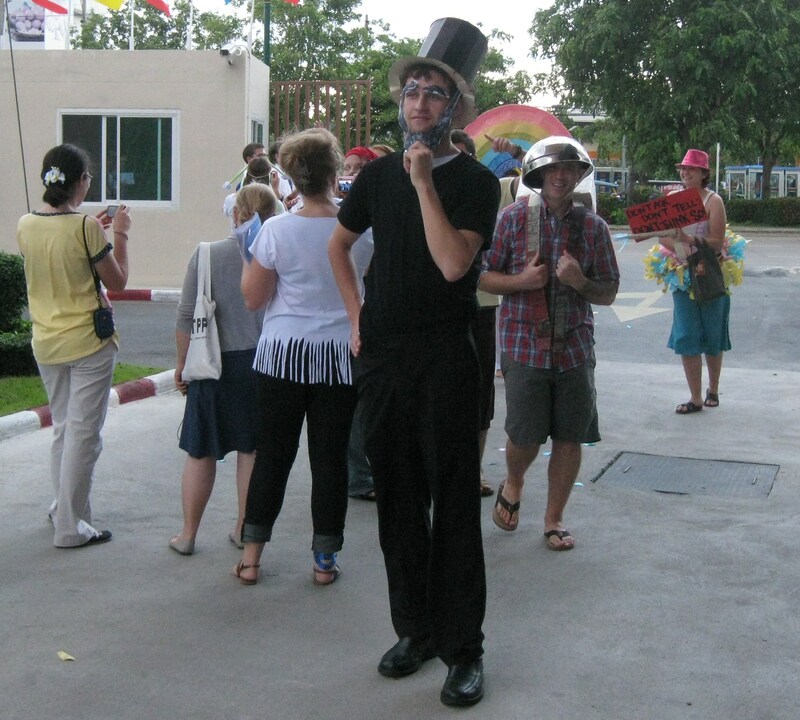 This entry was posted in Peace Corps and tagged minnesota, peace corps, thailand by Jeff Jackson. Bookmark the permalink. Good story! I was a PC volunteer in El Salvador (2001 to 2004). The guy that I shared a room with during staging in Miami is one of my closest friends now – we communicate several times during the week and he’s a brother to me. You are so right on about the experience bonding. Thanks this is Good Stuff, JJ. A good hike this time of year in Banning is Wolf Creek Falls with all the fall colors. My father used to work there I’ve hiked it many times. It was actually a featured hike in a recent edition of Backpacker the Magazine.